KOKOMO, Ind. — Cody Dunham takes great pride in winning an intramural basketball championship during his undergraduate college days. Intramural basketball. See more pictures on Flickr. Those are the kinds of memories he wants to build for Indiana University Kokomo, as he plans the campus' new intramural basketball program. Games begin Tuesday, February 25, in the Cougar Gym. "An intramural program is an important part of many students' collegiate experience," said Dunham, who will manage the league as the graduate assistant for the Cole Fitness Center. "It is one of the more unifying and friendship building experiences on campus. It is a great way to add to the IU Kokomo experience, and get students more involved. I am glad to be part of building that identity." Intramurals give more students a chance to participate in sports while in college than the intercollegiate athletic program can allow, and provide a social and fitness experience, according to Todd Gambill, vice chancellor for student affairs and enrollment management. "We're excited about this plan to allow our students to play in our beautiful new Cougar Gym," Gambill said. "We're hoping to springboard from this program into a full blown intramural program, with several sports available to our students, faculty, and staff." Teams will play once per week, with minimal practices, and in a less structured environment than a collegiate team. Students will serve as paid officials for the approximately one-hour games. Regular season play continues through March 14, which is the week before spring break. There will be a single elimination tournament the week of March 24. The intramural program is open to both men and women, and Gambill hopes for good participation from both. Teams representing the campus fraternity colony, faculty and staff, and other student organizations signed up for the first season. Students not on a team can sign up individually, and Dunham will place them on teams. "It's neat for students to see their professors in a completely different environment, and be able to build those relationships," Gambill said. "It's also a great way for them to meet and socialize with students outside of their major, or from other student activities groups." If the basketball program is successful, Gambill hopes to add other intramural sports, possibly including flag football, indoor soccer, softball, or ultimate Frisbee. 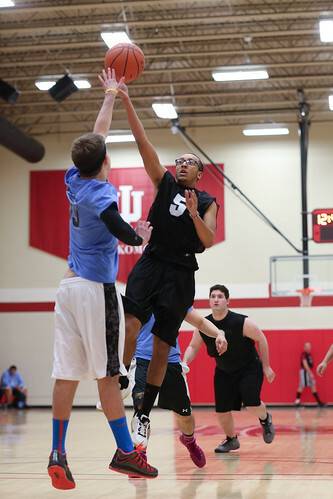 For more information about the IU Kokomo intramural basketball program, contact Dunham at cldunham@iuk.edu.